Tryton Medical has secured approval from the US Food and Drug Administration (FDA) for its Tryton Side Branch Stent to treat coronary bifurcation lesions. The regulator approved the stent's premarket approval (PMA) application to treat coronary bifurcation lesions involving large side branches. Claimed to be the first FDA-approved bifurcation device, the stent is available in different device diameters ranging from 2.5mm to 3.5mm. It can be used with any conventional drug eluting stent in the main vessel. Developed by using Tri-ZONE technology, the Tryton’s cobalt chromium can be deployed in the side branch artery by using a standard single wire balloon-expandable stent delivery system. The post hoc analysis of randomized investigational device exemption (IDE) clinical trial demonstrated that Tryton Side Branch Stent reduced the need for additional bailout stenting and provided significant lower side branch percent diameter stenosis at nine month follow up compared against provisional stenting. The company is currently marketing the stent in the Europe, the Middle East and Africa, in addition to the US. 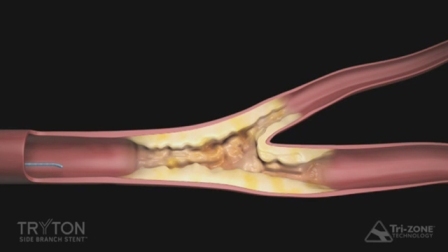 Tryton Medical president and CEO Shawn McCarthy said: “It is estimated that nearly a third of all patients treated with angioplasty each year have a bifurcation lesion, and the standard provisional treatment approach leads to side branch occlusion and bailout stenting far too often. Image: Tryton Side Branch Stent will be used for the treatment of coronary bifurcation lesions. Photo: courtesy of Tryton Medical.